Menorah Lighting Atop the Freedom Tower On Monday evening, December 18th, the seventh night of Chanukah, the Orthodox Jewish Chamber of Commerce held an inspirational menorah lighting ceremony on the One World Observatory, on the 101st floor of the World Trade Center’s Freedom Tower. This symbolized the Jewish communal business world utilizing the strength of its spirit and commerce to defeat darkness and hate. “Here, in the heart of the business world, we are declaring that nothing will deter us from succeeding and making the world a better place,” says Duvi Honig, Founder and CEO of the Orthodox Jewish Chamber of Commerce. An array of dignitaries participated in the World Trade Center ceremony including Rabbi Yosef Carlebach, Chabad Rutgers; J. Morton Davis, Chairman of the Orthodox Jewish Chamber of Commerce; Adam Bisnowaty of the New York Giants; Rabbi Mendy Carlebach, Chaplain Port Authority of NY and NJ, and Orthodox Jewish Chamber of Commerce Ambassador; LenceBryer, Transportation Security Manager at JFK International Airport; Officer Emanuel Almog of the U.S. Department of Homeland Security; and event coordinator Rebecca Musumeciof Legends. The Menorah in the Observatory was lit by Rabbi Yosef Carlebach and J. Morton Davis, followed by lively renditions of Maoz Tzur and other Chanukah melodies. Prior to this ceremony, Rabbi Mendy Carlebach lit a menorah at the tower’s Oculus below ground level, accompanied by a lively performance by the Maccabeats. A special menorah made out of scrap metal recovered from the ruins of the Twin Towers was used – offering poignant symbolism and optimism. Event coordinators Lieutenant Scott Pomerantz of the Port Authority of NY and NJ and Rachel Kraus, VP of Marketing at Westfield World Trade Center, were in attendance. The Ground Zero menorah and presence of transportation and security officials were particularly noteworthy, coming mere days after a failed ISIS terror attack on the New York City subway system. The message of bringing light unto darkness, and not weakening resolve, permeated the ceremony as the flames flickered. Rabbi Yosef Carlebach observed how it is the everyday Jewish businessman, even more so than religious leaders, who can illuminate the world. “When a businessman conducts himself properly in the business world and is proud of who we are, we share our light with the entire world,” he explained. 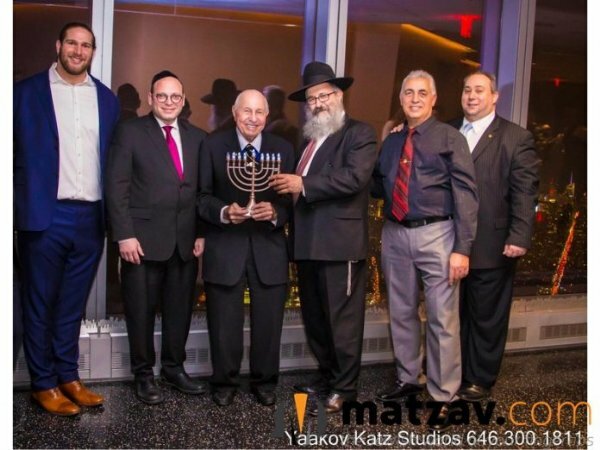 The symbolism of a menorah atop the center of New York’s Financial District was also not lost upon Chairman Davis: “The Jewish People epitomize how after nearly getting destroyed, we can rise to the top of the world in terms of achieving good for the world,” he stated.